Brunson Miller is from Murrells Inlet South Carolina. 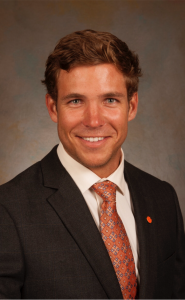 He is a recent graduate of the 18-month Master of Real Estate Development program in Greenville, SC and holds a Bachelor’s Degree in Management and Finance from Clemson University. Brunson has prior work experience as Superintendent of Construction for South Bay Builders, a single-family development and construction company located in Murrells Inlet. There he was responsible for all construction activities and customer relations. Prior to that, Brunson worked with Samet Corporation in Charlotte on industrial and retail projects across the Carolinas. Brunson holds his SC Real Estate License and is an active member in ICSC, ULI, and the Charleston Metro Chamber of Commerce.